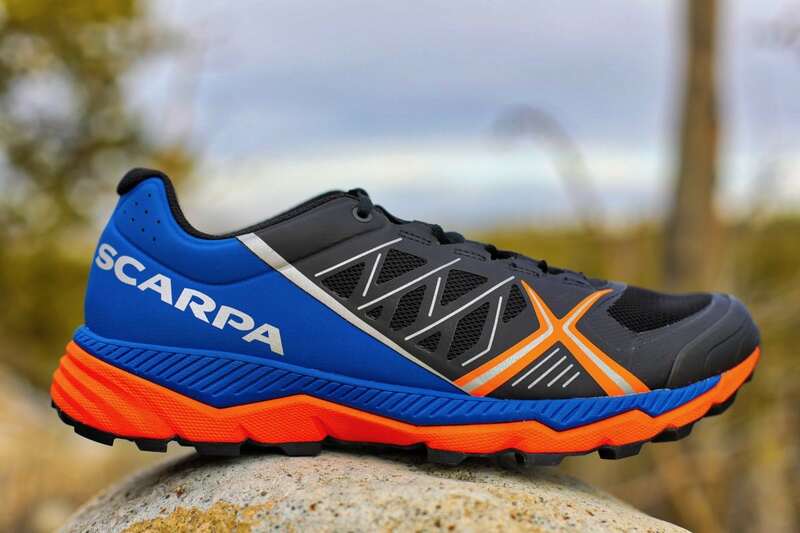 With some brands like Pearl Izumi leaving the trail running scene along with the increased popularity of the sport, we have seen a few new brands pop up, like Scarpa. 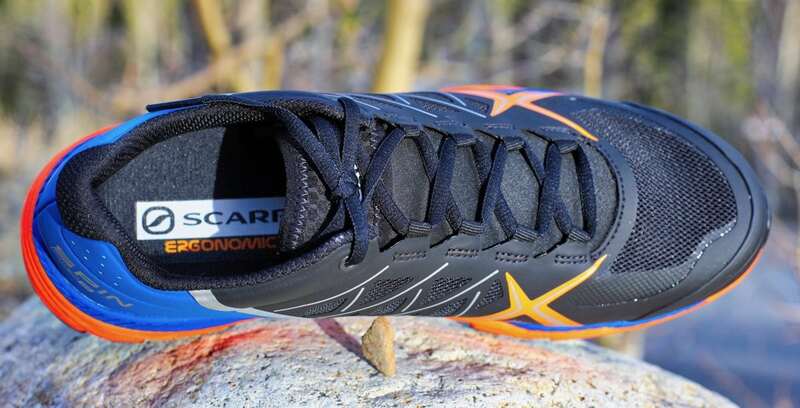 The theme for the Scarpa trail running line seems to follow the idea of precise fit and lots of traction. The Scarpa Spin RS ($135) fits in that mold quite well. The Spin RS is the slightly cushier and roomier version of the Scarpa Spin which launched last year. It is meant for more time on feet or for those seeking a less-firm ride. Even with using softer foam, the Spin RS is far more of a classic, speedy-feeling trail runner that connects you to the ground over the current crop of high-stack, vibration-dampening, long haulers. It weighs in at 9.3 ounces for a men’s size 9 and 8.8 in a women’s size 7. It features an 8mm drop, some aggressive luggy tread, and a close, sock-like fit. The Scarpa Spin RS is an updated version/sibling to the existing Scarpa Spin. This shoe weighs in at [under] 10 ounces in a men’s size 9 and 8.8 ounces in a women’s size 7. It features an mm drop, a booty-like construction, and a Vibram-lugged outsole. With that in mind, let’s get up close and personal and see what this shoe is all about. What you’re going to see right off the bat is that these things are dirty. It’s been a wet and muddy season here in the Pacific Northwest, and these shoes were definitely helpful and up to the task. Let’s start on the upper and work our way around to that tread pattern. To start off, we have a pretty complicated upper. A lot of times these days, we see lots of mesh and mesh and mesh and mesh and that’s about it. This shoe really incorporates a lot of different components to give it that locked-down feel. One of those is this Exoskeleton, as Scarpa calls it, and it’s basically just this overlay on top of the mesh that creates a bit of a grid and some connection points so that when we lace it down, it creates a nice wrap around the arch and the lateral part of the shoe. We can see that here on the medial as well as the lateral sides of the shoe and just see that this is not a flimsy type of upper. There is mesh which keeps it lightweight, but we are getting extra weight from this laminate. That also creates a bit of a mud guard all the way around the shoe where if we’re kind of steeping in puddles, the water has to go up above the sole for it to start leaking into the shoe and start getting wet. As we work our way toward the back, we notice that the fabric changes to a complete TPU overlay or skin here that runs all the way around the back and back up to the halfway or medial part of the shoe here. Again, lots of material which hopefully adds to durability which is maybe a good thing. You get a little weight sacrifice in here, but durability seems to be an ongoing problem with uppers right now, so, so far, so good on this one after 100 miles or so. I still feel like this thing is holding up really well. We move around to the front and we have a really solid toe bumper here on top of the other laminates. Again, we’re getting reinforcements all the way around. Standard eyelets are here connected to that TPU shell, and when we lace, they really do a nice job of locking down. Not standard laces, but more of this loop-type of eyelet versus a standard metal eyelet so they’re not going to rust or pull out or anything like that—it’s all part of the upper. Again, that TPU screen gives a lot of lock down on the foot. We move around to the heel and you can see that it’s not a fully caged heel that we’ve seen with a TPU or plastic insert back there. It’s collapsible, but there’s definitely enough structure there that there’s a good heel lock, and it keeps your foot in place especially on rugged terrain. When we move to the tongue area, that’s where this shoe is a little bit interesting. There really isn’t much of a tongue. You can see as I move this area around, this is all stitched in all the way down to the bottom of the shoe and even underneath the sock liner. That’s what really creates this booty-like feel. It keeps dirt from getting in there too far. The one downside is it’s so thin that it’s really just a piece of fabric here, so it can create a little bit of stress on the upper part of the foot if you have it tied down too tight. Luckily, with this kind of skeleton thing, it’s maybe not as much of an issue, so overall I felt pretty good about that system of that sock or booty-like fit. When you slide your foot into it, it really wraps on there internally as well as with that skeleton on the outside. You have a lace garage here for tucking your laces away and not getting them snagged on anything. There are fairly standard laces here, too. One thing that I thought was kind of interesting about the Scarpa sock liner was that this is kind of a dual-density sock liner. It’s actually one type of sock liner and then they added another bit of film over the top of it. It’s a little thicker here in the back and a little more firm. It retains its shape, and then it gets softer as it goes up. Another thing to note is inside the shoe on the bottom part where the sock liner sits, it’s kind of a gritty type of feel. What I found is that gritty feel plus the gritty feel on the bottom of this really keeps that sock liner lined up. Again, I think the key to this shoe is that it holds really well and has a nice fit on your foot, and all of these components are adding up to make that happen. 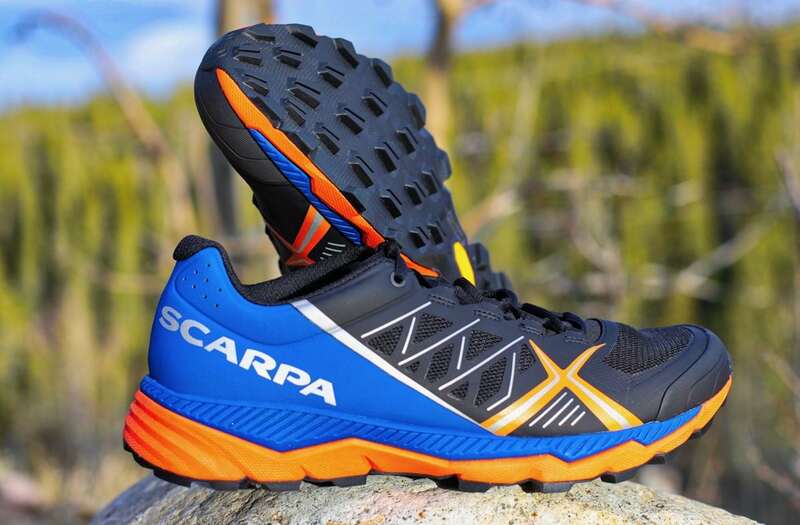 The Scarpa Spin RS lateral upper. As we move into the midsole, this is one of the places where the shoe differs from the standard Scarpa Spin. We actually have a dual-density midsole here. We have a little firmer type all the way through the middle, and as we move to the bottom, we have a slightly softer secondary part of the midsole here. They’re very consistent all the way around. It’s more layers of foam rather than having some sort of pronation control or something like that. Soft foam, firmer foam, and then adding to that ride. I’ll still say that this foam, even though it’s labeled as being softer, it’s still a fairly firm ride. It’s not something that feels sloppy or feels like rocks squish and disappear into. It’s firm. You feel it. That’s one of the things about this shoe that makes it unique is that it is a “really feeling the trail” type of shoe even though it has a thicker sole than the Scarpa Spin standard edition had. The RS is meant to be their ultra shoe. It’s got a wider platform. It’s got a little bit more cushion on it. I’d say in comparison to the majority of the trail shoes out there, this is still a pretty firm-feeling shoe. Something to keep in mind. The Scarpa Spin RS medial upper. Then I’d say the hallmark here of the Scarpa brand in general is the aggressive tread. The RS has a Vibram outsole, and I really felt like these were aggressive and toothy and they bit really well even on some super-muddy stuff. One time in particular, I was climbing a hill with a bunch of friends, and I seemed to be the only person not sliding all over the place. Even though they’re not super, super deep, they’re well placed with the directional forward and backward lugs and even some different angles here toward the back and at the toe. It made for a really awesome tread pattern and something I could really feel. 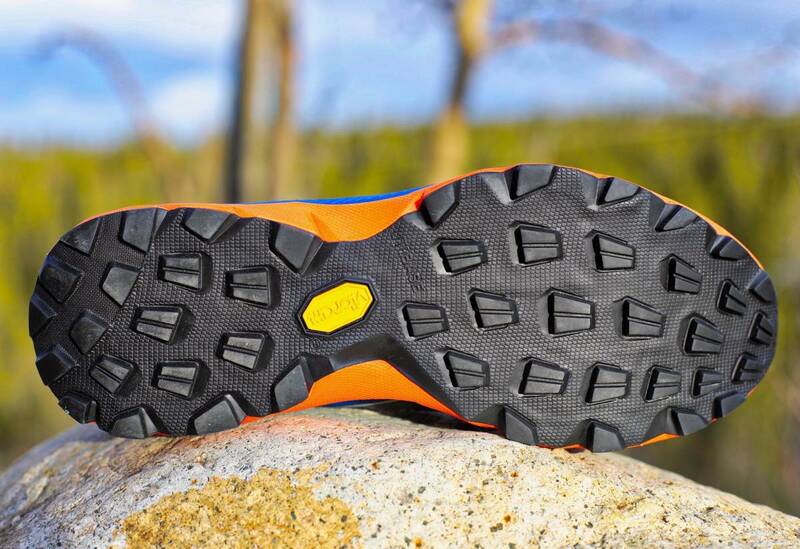 The Scarpa Spin RS outsole. In closing, there’s a lot to like about this shoe. In fact, one of the things I think is nice about it is it doesn’t fit the traditional mold that we’re kind of seeing right now which are squishier types of shoes with lots of padding which I do like, but this is definitely a more racy, connected-to-the-ground type of shoe even with its 8mm drop. It feels low. It feels like you have good control. It just works really well. The downside of that is you don’t have that more super-protective feel. Even with this RS being the roomier fit and the more padded version of the Spin series, it’s still a pretty firm ride. If that’s something you like, this is a great shoe for that. If you’re looking for that, “I want to tap dance across a bunch of jagged rocks and really feel that foot placement and nimble type of feel,” this has that, but this definitely isn’t for the tender-footed out there. With that said, any questions or comments, leave that below this video. Thanks for watching. We’ll catch you next time. 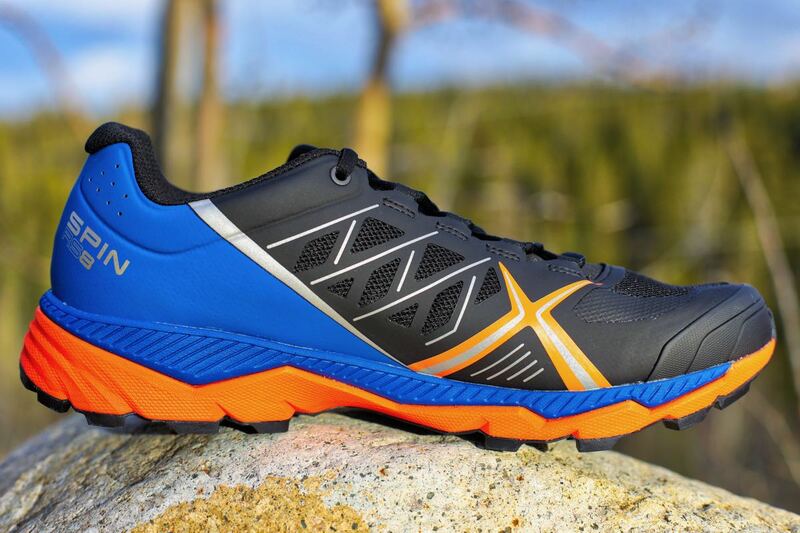 Have you run in the Scarpa Spin RS? What do you think? Have you tried both the Scarpa Spin and Spin RS? If so, how do the two models compare for you? What do you think of the Spin RS’s well-constructed upper? And how about its outsole? The Scarpa Spin RS view from the top. Thanks for the review. Looks very close to the Salomon SpeedTrak. Would be interesting to compare the two back to back.